You guys, I CANNOT get enough of Zoodles lately! If you haven’t heard of “zoodles”, they are simply spiralized zucchini. And let me tell you, it’s a great substitute for regular, high calorie pasta or rice noodles. They’re mild and take on the flavor of the dish that you’re cooking them with, so they’re the perfect compliment to just about everything. I’ve been trying them with several my favorite pasta recipes and they’ve been fabulous. I love how easy they are to make. I use THIS spiralizer and I can have a whole batch of zoodles in just a few minutes. Not only are zoodles easy, but they’re just perfect in pasta recipes. They cook up to be very similar in texture to pasta. They’re firm, but still tender. They’ve got enough body to hold together and they’re so mild that they work well in a variety of pasta dishes. As long as your sauce is flavorful, you won’t even notice that you don’t have your regular pasta in your dish. Well, you won’t notice that you don’t have pasta in your meal until you go to count up the points. Because, let me tell you, zoodles are the way to go. Since they’re made from zucchini, they’re not adding points to your meal. That means you can fill up your plate with zoodles, add your favorite sauce and still come out ahead with your points! You get all the pleasure of indulging in your favorite pasta dishes without the guilt of using all your points up for the carb laden and high calorie pasta. 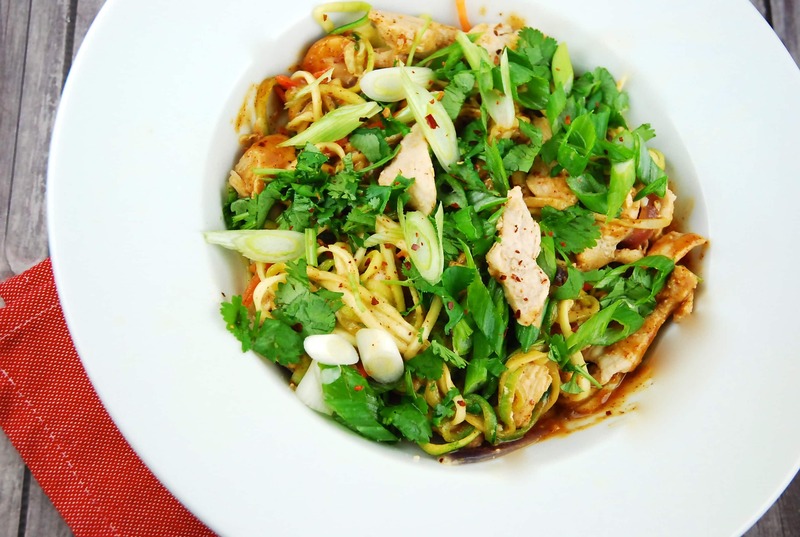 But let’s get back to this delicious Chicken Pad Thai with Zoodles. Since I’ve tried the zoodles in other recipes with such great success, I decided to try it in one of my favorite noodle recipes of all time – Pad Thai. Traditional Pad Thai is made with rice noodles, which are great if you need to avoid wheat or gluten. But for most of us, they’re not better than regular pasta. They’re still high in carbs, calories and points. Rice noodles are typically soaked in water for about 20-30 minutes and then stir fried at the end with the sauce. This makes zoodles the perfect replacement. You don’t want to overcook your zoodles, or you’ll end up with mush. Steaming zoodles in the sauce for just a couple of minutes at the end is all you need to cook them up so they’re tender, but still firm enough to hold together. Let me tell you, this Chicken Pad Thai with Zoodles is amazing. It turned out simply fantastic. It was delicious and filling. It helped to satiate my craving for Pad Thai but was definitely healthier than getting it from a restaurant. If I’ve got the extra Points to spare, I like to sprinkle on some crushed peanuts just before I serve it. It really gives it the authentic, restaurant feel. Trust me, this is going to become a favorite. It’s simple, delicious and far healthier than take out. Fresh, light and flavorful, this is one seriously delicious, yet low calorie, Pad Thai. Using “Zoodles” instead of traditional rice noodles, this beloved recipe gets a very healthy makeover. In a large skillet or wok, heat oil over medium high heat. Add in chicken and garlic, and sauté until chicken is cooked through and browned, about 5-7 minutes. Remove from pan and set aside. Return pan to heat, and add in white onions and bell pepper. Cook, stirring often, until veggies are tender, about 3-4 minutes. Return chicken to pan, and add in “zoodles”, and cook for another 2-3 minutes, stirring/tossing often. Transfer entire pan to a large bowl. In a small bowl, whisk together peanut butter, soy sauce, sesame oil, lime juice, honey, fish sauce, and red pepper flakes. Pour sauce into the large bowl with the chicken and veggies. Toss well to combine. Top with cilantro and green onions. Just finished this and it was fantastic. I used powdered PB and it was delicious. My husband loved it and took a photo of it to send to my son., very pretty dish with all the colored veggies, I used a red bell pepper to add more color. Thank you so much for your great recipes. I keep asking and maybe one day you will fix your print button. Clicking on “print friendly” only gives the photo and description, no recipe. Please? I’m wondering if this might even be less points if PB2 (powdered PB) was used!